It was my first time in Como and I spent a whole weekend there. It's so pretty and close to Switzerland that I am sure I'll come back more often. I love discovering new Italian landscapes and this one is overwhelming. It's incredible how green the water looks just like emerald green. 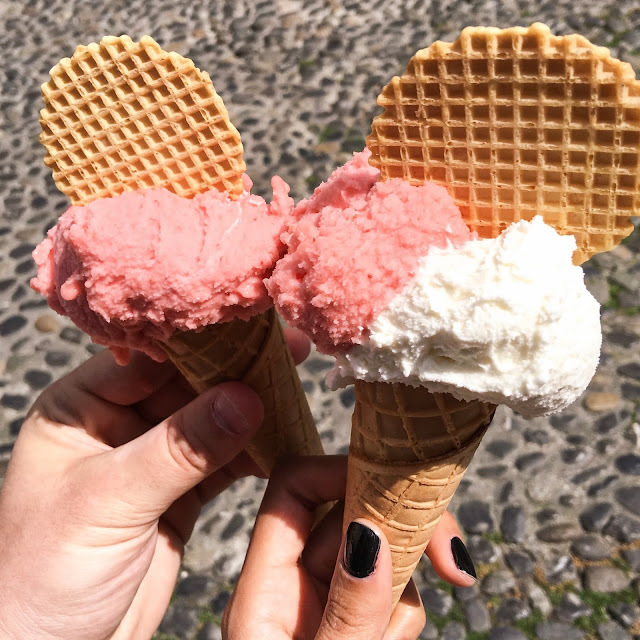 As each time I am in Italy and as a tradition I had to indulge myself with a gelato. OMG, I can't help, but "fiore di latte" is the best flavor on earth ! Don't you agree ? That day the weather was pleasant, not too hot and not cold, so I went for destroyed denim and striped shirt with my beloved Gucci shoes. It was such a nice walk through Como. Looking really cute and chic !